Common problems with stock cylinder heads on the Chinese 4-stroke engines are generally known to be expensive and involve high costs. Chinese replacement cylinder heads for GY6 engines are only of medium build-quality. 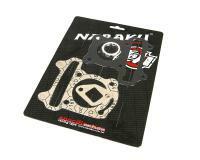 Help comes in the form of a well-manufactured replacement cylinder head from NARAKU, made to Taiwanese manufacturing. 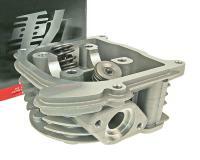 The cylinder head is supplied fully assembled with valves and springs and is ready for installation. The cylinder head has been deliberately produced without an SLS connection. The result will be a slight increase in performance, and the head can be mounted on any GY6 50cc / 4-stroke Kymco vehicle. Whether equipped with or without SLS, it will be closed off and the exhaust connections blanked. Suitable for 50cc Chinese-built GY6 4-stroke engines and Kymco 50cc 4-stroke engines. 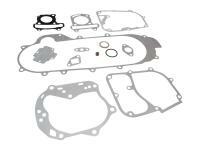 Please order cylinder head and base gasket separately. Installation instructions can be downloaded below.